Just because Donald Glover is playing a young Lando Calrissian in the upcoming anthology movie Han Solo: A Star Wars Story doesn't mean Billy Dee Williams is done with the character. Though the iconic Star Wars actor has given no hint as to where the much older Lando may appear next. Earlier this week, Williams met with Glover to discuss the role of Lando in the Han Solo movie. And now Billy Dee Williams is sharing some thoughts about that fateful lunch and where he stands in terms of the Star Wars universe. During his conversation with The Hollywood Reporter, Billy Dee Williams dropped two very important hints about not just the Star Wars anthology that will see Donald Glover taking over his role, but also his own possible return in a future Star Wars movie. At this time, there has been no mention that Billy Dee Williams will return in Star Wars 8, which is officially titled Star Wars: The Last Jedi. Many suspect that he is being saved for the third and final chapter in The Force Awakens trilogy. Williams doesn't confirm that. But he does say this. "I'm not saying goodbye to that character. It's still very much a part of my life. I created that character." Williams doesn't say much about the upcoming Star Wars sequels, if anything at all. But he did touch on the Star Wars spin-off that will recycle his character at a much more youthful age. And he actually offers up a hint about the story line. Asked if he's discussed the Young Han and Lando adventure with his former co-star Harrison Ford, Billy Dee says this, giving a big hint as to what we can expect from the movie. "Yeah, this one is about how we established our relationship and the question of the Millennium Falcon. I have not spoken with [Harrison Ford], he's too busy." Billy Dee Williams went onto talk about his well documented lunch with Donald Glover. Asked if there was any way Glover could be as cool as the early version of Lando, Williams playfully scoffed. No, of course not. That would be impossible, right? Billy Dee says this. Well, nobody's as cool as me. (Laughs.) That's a tough way to go. No, I'm only joking. Donald is eclectic, I think that's really important particularly for the character of Lando. He is particularly eclectic in the way he approaches his art. When I talked to him I really got the sense of him being a worldly person. Last year, Billy Dee Williams said he thought the producers behind the new Star Wars movies should just leave Lando alone. Williams has now clarified those statements. He says this about resurrecting Lando for the big screen. "To me, I guess what it is that I identify so much with Lando. I mean, Lando has been very much a part of my life for over 30 years. When I go out and do conventions and stuff like that, even though people know me from all the other things that I've done, certainly [Lando] takes precedence. 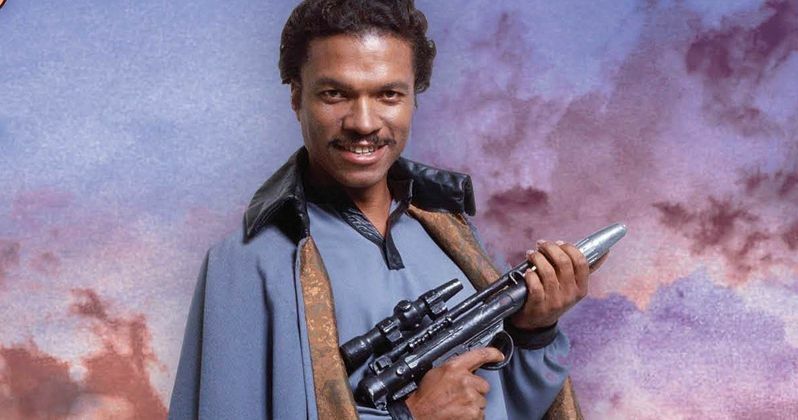 I just never thought of anybody else being Lando. I just see myself as Lando." Billy Dee Williams later remarked that he'd love to have a cameo in Han Solo, but Lucasfilm and Disney have not asked him yet. In regards to Williams' comments about the Millennium Falcon, it was noted that a recent Funko Smuggler's Bounty toy box claims Lando is the one who teaches Han Solo how to 'fly a ship'. Lucasfilm story group members Pablo Hidalgo and Matt Martin have not responded to requests about this official piece of merchandise, with fans wondering if the ship in question is the Falcon, or if Lando straight up taught Han Solo how to be a pilot.